Brief Description: Twisters and precipitation and wind measurement–oh, my! Demonstrations abound in this fun-filled, weather-themed program. Introduction and a brief explanation of the difference between weather and climate. Climate on Weatherwizkids.com has an easily understood explanation of the difference. We set this experiment up towards the beginning of the program so that kids could see the progress of the rain in the jar throughout the rest of the program. They enjoyed observing the changes in the jar. 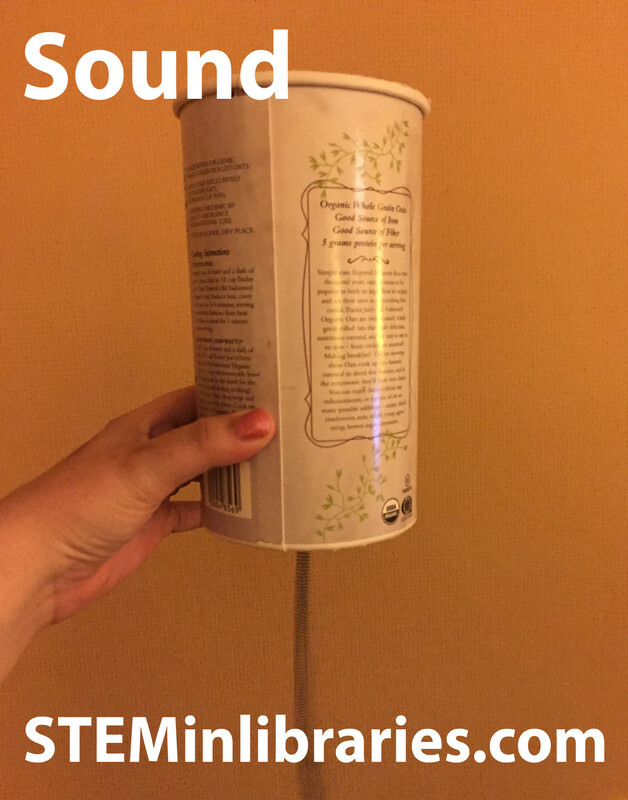 We used both the Soda Bottle Tornado on Stevespanglerscience.com and the Tornado in a Bottle on Stevespanglerscience.com as resources for our demonstration. It was exceedingly successful with the kids. They thoroughly enjoyed watching the tornado form, and wanted us to demonstrate it again and again, as well as try it themselves. After the program, the kids eagerly pulled their parents to the tornado experiment to show them. The anemometer was an interesting project to try, but was ultimately too difficult for the kids to do. They needed extensive help stapling their cups to the straws, and the hole punch was difficult to manage. They enjoyed the finished product, though, and enjoyed showing it to their guardians after the program. The Anemometer project, although very neat and fun, was much more difficult to do then expected, especially for the program’s targeted age range. Due to this, we would make modifications to the assembly of the anemometers. In our original program, the kids did everything on their own, aided heavily by librarians; next time, we would opt to pre-assemble the cup portion of the anemometer, and have the younger kids instead count the stones placed as weights in the bottom container, and have them decorate their anemometers when fully assembled. To make the anemometers more fun after they are assembled, we suggest having the kids try moving it by blowing on it, or perhaps having a hair dryer on hand to create a strong wind. 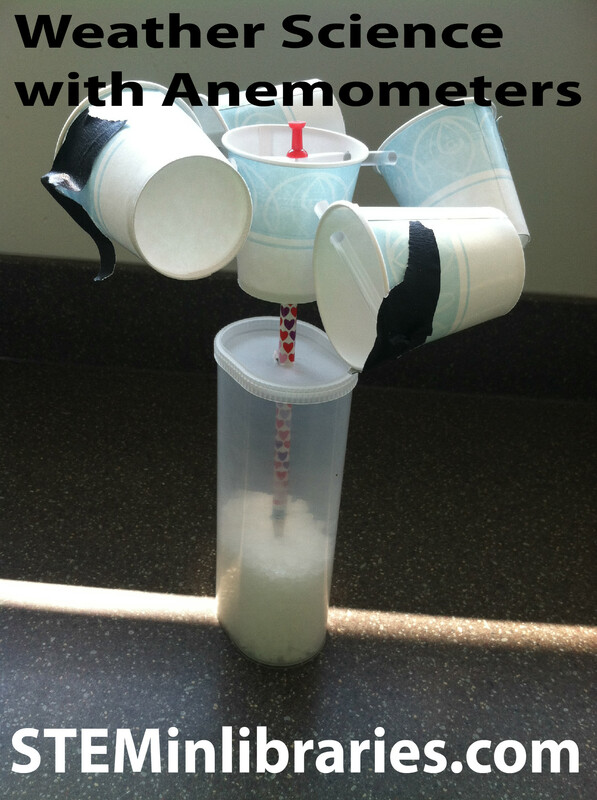 If you have easy access to outdoors, taking their newly created anemometers would be fun. This program would work well for an older audience, both teens and tweens. Teens would easily be able to assemble the anemometer, and to make the build a little more challenging, perhaps write-out the build instructions for them to follow on their own. For tweens, they would most likely be able to assemble the anemometers themselves, although the stapling part would be difficult for them to manage. We think it would be best, for the tween age group, to have them build the project in tandem with an instructor, all together as a group step by step. For another program idea, the popularity of the tornado tube experiment might make it worth it to invest in enough tornado tubes to have a program focused solely on that for either kids in grades 1st-3rd, or 4th-6th.